A Fantastic Fear of Everything is a Film programme that first aired in 2012 and has been classified a 15 certificate. Professional children's writer Jack (Simon Pegg) started to develop an irrational fear of being murdered when his agent Clair (Clare Higgins) commissioned him to write an adult novel about Victorian serial killers. His research has turned him into a quivering wreck and he's been carrying around a carving knife ever since. Jack has even developed a phobia of laundrettes but with the help of friendly therapist Dr Friedkin (Paul Freeman), he has resolved to face his fears and heads off to get his clothes washed, ready for a big literary meeting. Is this his chance to finally put his phobias behind him and move on with his life? Or will the fears he is now facing prove well-founded? 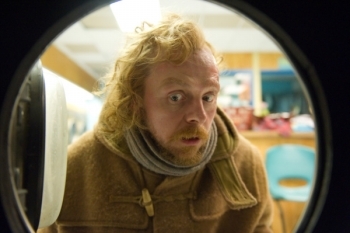 Star-turn Pegg is in Spaced mode here, perfectly cast to make use of the eerie angles, moody lighting and cultural send-ups that form this offbeat comedy. Turning his hand to directing is Kula Shaker frontman Crispian Mills, who infuses the feature with the same psychedelic, often Indian-inspired vibe that his music is known for - the eccentricities make for a unique, if at times testing, result. For all their good intentions - and the premise is a great one - the inexperience of the debut directing duo is evident; however, full marks for ingenuity.